Spiders come into your house to eat the other pests that make your home their own. By diligently getting rid of other insects, the spiders will have less access to food, and you’ll eventually see less of them around. Part of this method is keeping your home tidy. Pests need places to hide, and a messy space leaves plenty of spots to hang out. Spiders will happily make their nearly invisible homes within your home, which have the additional function of sustaining spiders by catching food for them. You can encourage your spiders to build their webs outside your home rather than inside by running your vacuum along the places where the walls meet the ceiling and floor, which are the dark and inaccessible corners where spiders prefer to reside. Spiders are averse to the scent of eucalyptus. Sprinkling eucalyptus oil or spreading eucalyptus leaves on your furniture, in corners and in your closet will discourage spiders from building their homes there. White vinegar contains acetic acid that harms spiders, so by using a diluted vinegar solution you can safely and successfully repel these unwelcome guests. Do You Need Help Kicking Spiders out of Your Home? Seeing too many spiders can be indicative of a more serious pest problem because they go where there is food. 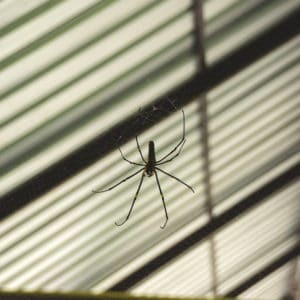 If you’re finding more spiders than normal, contact the pest professionals at Green Pest Solutions. We’ll be there to investigate your problem. Call us today at 877-636-9469.